Channel your inner Miyamoto (and Scrooge McDuck) in Engineous Games' latest creation. 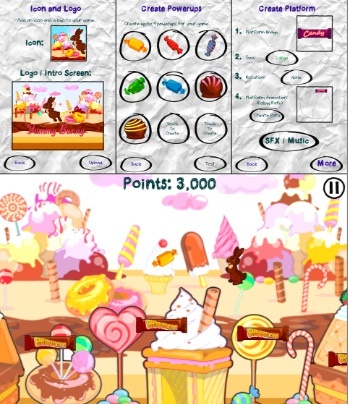 The concept of releasing creation tools that allow users to design their own games has been done before, even with the company's previous title, Sketch Nation Shooter. Being able to submit one's games to the studio for publishing and potential revenue, though, is by far the biggest selling point. Receive approval, and the folks at Engineous will not only sell it for $0.99, but also split the profits with you, which is a cool bonus to letting your imagination run wild; there is, of course, no guarantee that you'll make money. That said, Sketch Nation Studio is a bit more advanced than its predecessor. 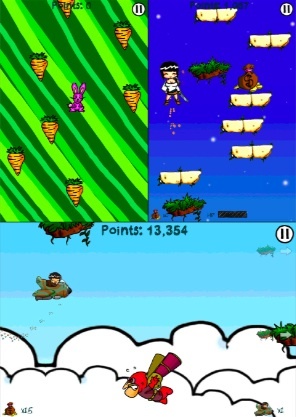 For starters, you have five types of games to make, including up jumping (Doodle Jump), down jumping (think reverse Doodle Jump), side jumping, side flying and side running (a platformer). Before getting started, however, you must choose between Simple and Advanced modes. The former is by far the easiest, as it lets you design and then play a game in less than two minutes. Just a few quick sketches via the new in-app drawing tool, some special effects and bam, you're good to go. Advanced, meanwhile, goes more in-depth, like a special effects tab that adds smoke flowing from a car's tail pipe, or a power-up that nets tons of points. You can even modify the controls, toggle hit points and gravity (low, normal,high). Basically, Advanced is there for those who enjoy tinkering with every little detail. Finish the game, and you can submit using the Stand Alone App Mode, where you'll even create a logo and icon. Just keep in mind Engineous doesn't have to publish your game, especially if it's bad. The cool thing is you can do all this for free. Finally, a news feed keeps track of what people around the world created and play, and this includes the people on your friends list. All of this makes Sketch Nation Studio quite ambitious. There's a ton of potential here, and it would be great for Engineous to lead the charge for a paid to create revolution. For now, all we can do is wait for this title to hit the App Store. Until then, we'll scribble game ideas into a notebook and dream of climbing the charts.